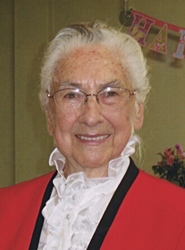 Miriam Hostetter Bailey, age 91, of Grand Rapids, MI, formerly of Chambersburg, PA, went to be with her Lord and Savior, Jesus Christ, on Sunday, February 3, 2019. She was preceded in death by her husband, Clarence; a son, John; and five siblings. Miriam was a pastor's wife for 40 years and was active in the life of her family and the church. She served as a representative for Global Outreach Mission of Buffalo, NY, and was well known for her talent as a seamstress. She will be deeply missed by her children, Gary (Karen) Bailey, Mark Bailey, Dale (Sheri) Bailey, Sarah Bailey, David (Deby) Bailey; her grandchildren and great grandchildren; siblings, Edgar Hostetter, Glenn Hostetter, James Hostetter, and Nancy Hostetter. A memorial service will be held at a later date in Chambersburg, PA. Contributions in Miriam's memory may be made to the Pregnancy Resource Center, 415 Cherry St. SE, Grand Rapids, MI 49503.